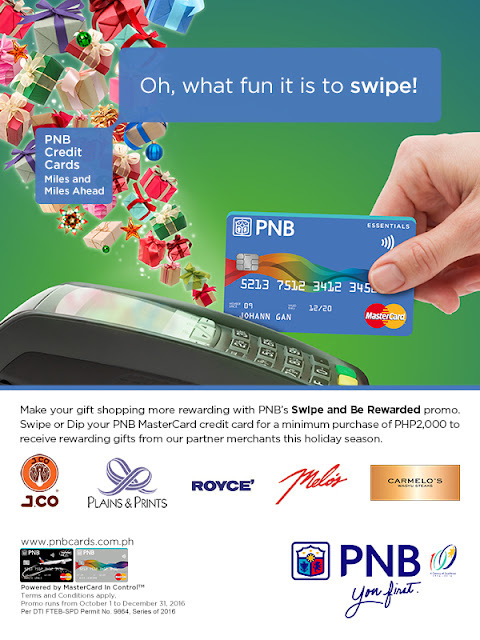 Swipe & Be Rewarded w/ PNB ~ Philippine Freebies, Promos, Contests and MORE! This season, receive exciting gifts with PNB's Swipe & Be Rewarded 2016 promo. Keep those cards swiping and enjoy gift certificates and discounts from J. Co, Plains & Prints, Royce', Melo's and Carmelo's Wagyu Steaks. For every single purchase transaction worth 2,000, receive P100 GC/discount. Swipe higher of at least P6,000 and get P300 GC/discount. Lastly, if you'd like to receive more, spend a minimum of P10,000 to claim P500 GC/discount. You may only redeem one (1) freebie per charge slip but you can exchange up to P20,000 worth of GC/discount regardless of the number of your cards.